In my early professional years in New York City, I was blessed to hear Ram Dass speak many times. One of his most potent teachings for me began with the question: What is a broken heart but an open heart? It was with Ram Dass that I first learned to look for the gift in whatever is happening – to sense the opportunity that is waiting, and then follow that opportunity to a new awareness or creation. He invited us to consider that when life isn’t going as we might like, or when things fall apart, that something is actually trying to get our attention. Because of what is happening, something new is now becoming possible. Something is shifting. A new door is opening. And it’s up to us whether or not we walk through that door and create something new. 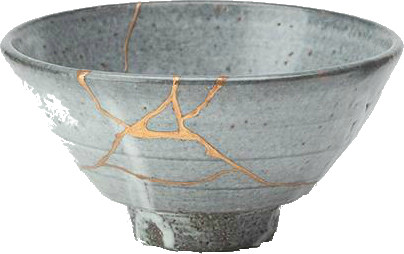 A few years ago, I learned about kintsukuroi, the Japanese art of fixing broken pottery with a lacquer resin that is dusted or mixed with powdered gold, silver, or platinum. Rather than trying to hide the fact that the piece of pottery has been broken, the repair is welcomed as another part of the object’s story. In fact, the addition of gold, silver, or platinum in the repair process can make the object even more beautiful, and perhaps even more valuable, than it was before. Through the repair, a new design or piece of art is created. Life is not always easy. You’ve probably experienced challenges, disappointments, and things falling apart. Perhaps you’ve felt emotionally, spiritually, or physically broken open. The scars of those experiences are woven into the fabric of your life. Hopefully, you find your way past those difficult times, yet what has happened doesn’t go away. What if you were to apply the philosophy and practice of kintsukuroiwhen something “breaks?” What if you consciously choose how you will be with what has happened – how you will treat your wounds, cracks, and scars – how you will relate to the experience itself. Will you let your wounds and scars define who you are and how you show up to life? Or will you take the concept of kintsukuroi, add some emotional gold and platinum, and transform your scars into strengths? Perhaps there is something new waiting to be created that will carry you forward. The practice of kintsukuroi invites honesty, courage, humility, innovation, and perseverance. And it fosters resilience. In Transformational Presence, we speak of several concepts from the Japanese culture that help us understand how to “show up” in the most effective and impactful ways. Kokoro, meaning “mind, heart, spirit,” is all about alignment of thoughts, motivations, intentions, awareness, and action. If you wish to accomplish a goal, create something new, or manifest a vision, kokoro invites you to first consider who you must “be” in order to do that. How must you show up? What qualities or characteristics must you develop and embody? The Japanese concept of Ma invites us to be intentional about the physical and energetic spaces in our lives – the spaces between us and the people around us, the spaces in between one thing and another, and the spaces we create to allow “what wants to happen” to unfold in the situations and circumstances of our lives. Kintsukuroi invites us to work with the pieces of what feels broken to make something uniquely beautiful. It invites us to allow the challenges and difficulties of our lives to be what they are without trying to hide them or pretending that they are less significant than they are. Instead, we allow what has happened to become a part of our life story. Taking the broken pieces and putting them back together in a new way becomes the next chapter. As we create something new out of the pieces of what has been, we, and our circumstances, are transformed. When something breaks open in your life or leadership, consider how the idea of kintsukuroi could make a difference. Metaphorically speaking, what gold, silver, or platinum “resin” can you apply to the broken pieces to create something new – something that might be even more valuable, beautiful, amazing, or impactful than before?